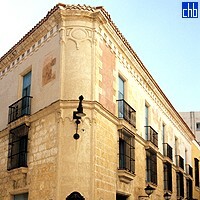 This comfortable little hotel, which shares some facilities with the adjoining Hostal Valencia, is housed in an eighteenth century building which belonged to the family of Don Pedro Regalado Pedroso y Zayas, who was a ‘Comendador de la Orden de Isabel la Católica’. The Hostal Valencia has become so popular that it is often frustratingly fully booked, but the Comendador is, if anything, even better, and certainly quieter, although it is slightly more expensive. The rooms are very comfortable indeed, and unlike the Valencia they have air conditioning – indispensable in the summer months. Highly recommended, whether you choose a high-ceilinged room on the upper floor or a more cosy one on the mezzanine. The right-hand back room on the top floor has a charming view of the Diana, Princess of Wales Garden and the ships coming and going in the harbour. 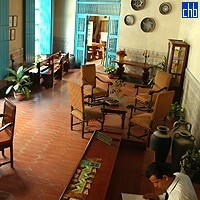 The tapas bar on the ground floor is excellent and is much frequented by European residents of Havana. The Comendador was restored and is now run by the Office of the City Historian of Havana, so all its profits are reinvested in the restoration of the city’s historical centre. There are two types of standard room at the Hotel Comendador – high ceilinged ones on the upper floor and lower ceilinged ones on the mezzanine. The high ceilinged ones are very attractive – as we mention in our introduction, Room 14 has a particularly good view over the ‘Garden of Diana, Princess of Wales’ to the harbour – with ‘Havana blue’ ceilings, attractive Colonial style furniture, old prints on the walls and baths with lion’s claw feet. The mezzanine rooms, although less spacious in terms of ceiling height, are also delightful with their decorative iron beds and little casement windows within larger shutters opening to the street, and similarly decorated bathrooms. Many clients favour the mezzanine rooms as being cosier and more welcoming than the grander option upstairs. 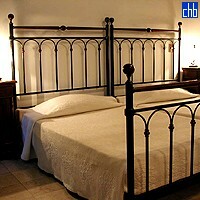 4 of the rooms have matrimonial bed. The other 6 are twin bedded. There is not an awful lot of difference between the high-ceilinged standard rooms at the Comendador and the hotel’s 4 junior suites. The latter are the same as regards basic characteristics (see below) but have the additional advantage of a small ante-room for visitors. The seating is exceedingly formal in style, though: lounging about seems inappropriate in these straight-backed Castillian-style chairs. One almost feels one should be clad in doublet and hose or ruffs and farthingales to sit on them.